Kenai River Brewing owner Doug Hogue packs cans of beer coming off the line of the company's new automatic canning machine. There seems to be no end in sight for the growth of craft brewing. 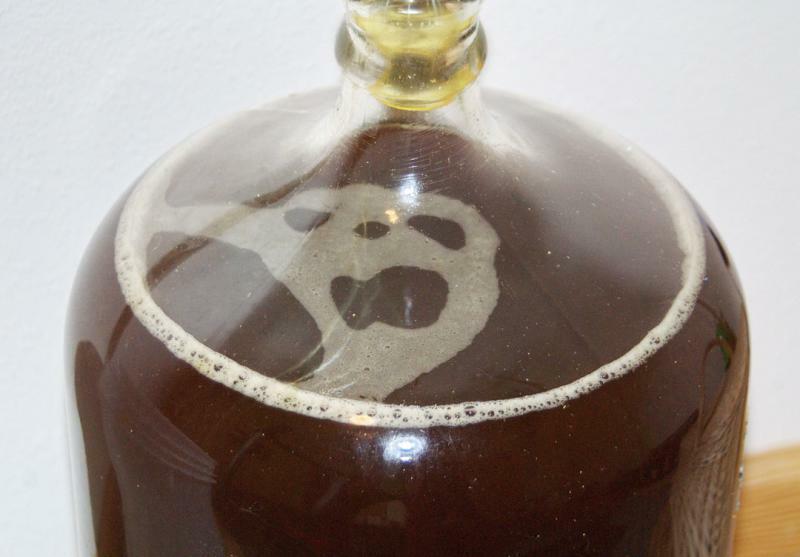 But how much beer do you have to make before it’s not so crafty any more? 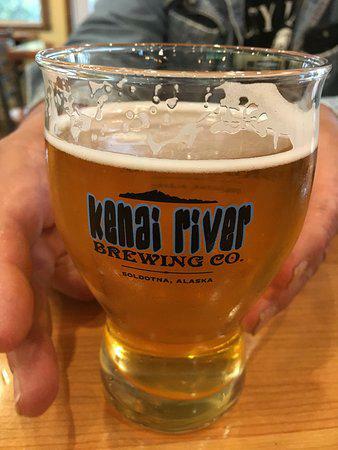 KDLL’s Shaylon Cochran had that question in mind when he spoke with Doug Hogue from Kenai River Brewing about the newest member of the team. The thing about making lots of beer is you have to put it somewhere. Kegs are good. But cans are better. 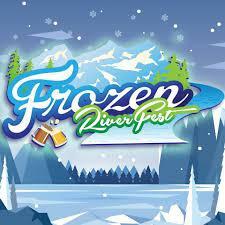 Kenai River has had cans available for years, but getting them filled was laborious. Owner Doug Hogue says at first, it was by hand. Just a few cans a minute. Then they upgraded to a machine they call HAL. When he felt like it, HAL could push a lot of canned beer, if someone was there to keep an eye on things. A small footprint was great in the brewery’s first location on Aspen Street in Soldotna. But the new place they moved into a couple years ago is basically a warehouse, so it was time for an upgrade. Hogue says his can salesman tipped him off about a company making canning machines for craft brewers from Colorado to Alaska. Slowly, the various pieces of the Codi craft canning system arrived, and eventually, so did a machinist to help put it all together. Brian Sewell has a pretty cool gig at Codi, making trips to the breweries to set up the machine and train staff. He says the market for machines like this is huge. “I’m from Denver. In Denver alone, in the city limits, there's 162 craft breweries. There's got to be, let's say 50 of those, ready to can and do some big production," Sewell says. This thing does about 47 cans a minute. It starts with an empty pallet of cans being fed through a marvel of machinery called a D-Pal — a de-palletizer. Up they go into a track that feeds them down, one at a time, quickly, into the filler. 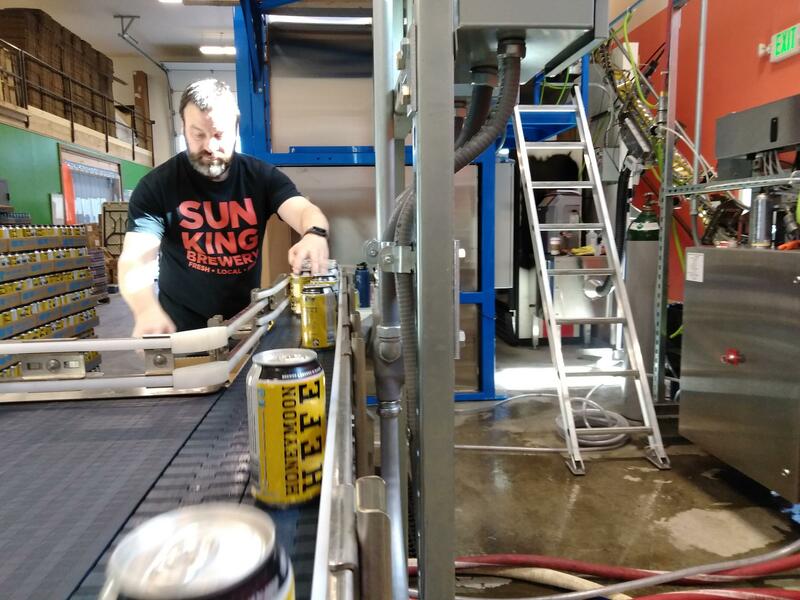 They’re given a quick rinse, laser-scanned to make sure they’re properly filled, capped into six packs, cased up and, finally, re-palletized for shipment. And, yeah, Doug says they already did the Laverne and Shirley thing. "At one point, we were doing the Lucille Ball thing with the candy. We were having to put the beers in our pockets. They were coming by too fast." Recreated classic TV moments aside, though, what this big, fancy new canner means is a lot more beer out the door with a lot less effort. But a machine like this begs the question, how much beer does a craft brewery have to churn out before it’s not so much a craft brewery any more? It’s a question Hogue has thought about. Quality is the main marker but, really, it’s tough to quantify and say X amount beer disqualifies you as a craft business. Hogue says this is a pretty good spot. Busy, but not too busy. And easier to handle now that HAL is retired. The new machine, by the way, is going by the name Swayze for the time being. The story behind that, though, is best told over a cold beer. KPEDD Forum: Kenai River Brewing Co.
Doug Hogue, owner of Kenai River Brewing Co., speaks about the history and development of KRB in Soldotna.